These number tracing worksheets are simple and repetitive but fundamental for several reasons. Kids practice holding a pencil properly, increase fine motor skills, and learn to properly write the numbers 0-20 on primary writing lines. Have kids say the numbers as they write them for number word correspondence. For slower workers, have them do half the page. Have kids circle their very best numbers. Don’t forget to give them a sticker or a stamp for a job well done! Grab your pencil, hold it the right way, and start tracing these 0's! Not too fast though. You need to shape them nicely and neatly. Ready, set, go! Five 0's per line on seven lines. Ta! Da! 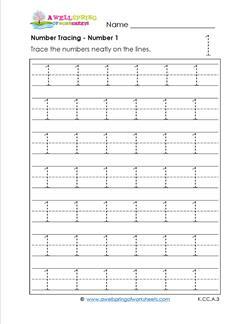 Number tracing worksheet for number 1. Ones are usually pretty easy to trace, except these 1's have the hook at the top and line at the bottom. If you like, don't trace those parts. Practice tracing number 2 on this number tracing page and you'll be ahead of the game when it comes to writing 12 or the numbers in the 20's ... or the 200's...or the 2,000's! Have you ever heard of a double decker bus? Well, the number 3 is a double decker number! It has two three quarter shaped circles, one on top of the other, nearly symmetrical. This number 4 is not staunch and stuffy, but it is prim and proper with its nice straight lines. This number tracing worksheet has one of several ways a 4 can be written. My grandma (a kinder teacher) always told me to think of the 5 as a man with a hat. Draw the straight line down, then the circle. Write the line across the top. That's the man's hat! Alley oop oop! That's the number 6. Start at the top and start tracing down (that's the alley part), then make the circle (that's the oop, oop part)! Where's your imagination? Number 7 is the captain of the ship. He stands straight and tall looking very confident & in charge. That should be your attitude when tracing the number 7's on this tracing page! Number 8 is a loop de loop. Start at the top & make a loop down to the left, then to the right, touch the bottom, loop up to the left, then to the right & stop where you started! Tracing number 9 is just the opposite of tracing number 6, except you don't start at the bottom. Start on the dashed line and make your way up around and then down. Number 10 on this number tracing page is large and in charge. Putting the 1 and the 0 together, it's taking up more space leaving room for only four 10's per line on seven lines. What do you get when you put 1 and 1 together? 11! And you thought you traced the number 1 a lot when you did the number 1 tracing page ... now it's more with number 11. Number 1 and number 2 have married and become one in this number tracing page for number 12. Yes, the 2 is the curvy one of the pair! Four twelves per line on seven lines. Number 13 is not the unlucky one. That's just superstition. Test it out. Print this number tracing page for 13 and see if only good things happen. At least you'll be a great 13 tracer! Look out! You're on number FOURteen. No flying golf balls here. Just a great number 14 tracing page. Give it your best shot & trace, trace, trace until you've got an ace in the hole! Five, ten, now 15. My how you've progressed through these number tracing pages. Keep up the good work and keep on keepin' on. Trace the four 15's on each line on all 7 lines. Great effort! Over the hills & through the woods to number 16 tracing page we go... No, no! It's not that hard. Just click the number tracing page, move your cursor to the lower right corner & click print! If the number 7 number tracing page was a captain, then this page for 17 is an admiral. The four 17's across each line representing the four stars on his uniform! Trace neatly. Here's the straight and tall number 1 with the loop de loop number 8. Now who said opposites don't attract? Use this number tracing page for 18 to practice straight & curvy lines. Just like 19 comes before 20, so this number 19 tracing page comes before the last page of this number tracing set. So rev up your engine and head for the finish line. If you've done all these number tracing pages, and you finish this page for number 20, then put a crown on your head or a sticker in your book, or whatever you do to show great effort!